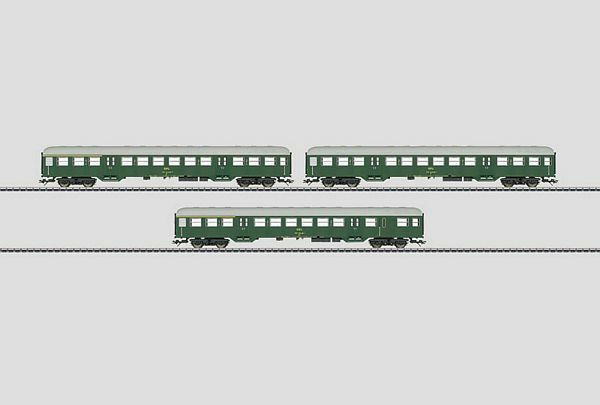 Prototype: 3 different Luxembourg State Railways CFL Silberling design commuter cars in a green paint scheme. 1 commuter car, 1st/2nd class, 1 commuter car, 2nd class, and 1 commuter car, 1st/2nd class with a baggage area. Model: The minimum radius for operation is 360 mm / 14-3/16". The cars have underbodies and trucks specific to their designs. 7319 current-conducting couplings or 72020/72021 current-conducting couplers, the 73406 pickup shoe, and the 73400/73401 interior lighting (2 each per car), and the 73409 marker light kit can be installed on the cars. Total length over the buffers 84.6 cm / 33-5/16". DC wheel set 12 x 700580. The class 3600 motive power to go with these cars can be found under item number 37338 in the Marklin H0 assortment.